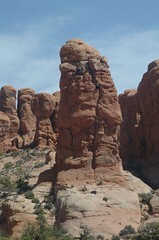 Not all of the rocks in Arches National Park were arches. There were also other interesting rocks. You notta foolin' me. That'sa notta mushroom! Oh, man, I've been found out. I mean, that's just a rock. It's probably not named that!